The cliffhangers on fall finales are a TV lovers dream. Producers know that before the hiatus kicks in, they need to leave their viewers wanting more. The desperation in these final episodes is palpable. 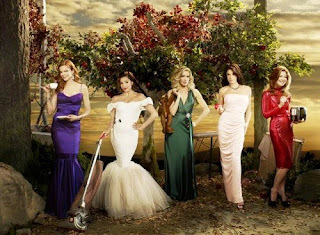 Last weekend's Desperate Housewives, Boom Crunch, did not disappoint. After six drama filled seasons, producer Marc Cherry knew that he needed a strong cliffhanger to keep his viewers coming back for more in the new year. And, just like last year when he axed Nicolette Sheridan's Edie, Cherry went with death. Although he originally insisted he was not killing off any characters in the fall finale, Cherry decided to kill several, including a fan favorite. In a move that was an obvious marketing ploy for ABC, Cherry had his characters killed by way of an Oceanic plane. For all you non-LOST fans (and trust me, all A Listers should be fans), Oceanic is the airline responsible for crashing onto the island. Oceanic itself is a character in the show, and following last year's successful Desperate Housewives-LOST commercial on ABC, marketing execs must have figured to keep the relationship hot. Despite the over-the-top Christmas party, it was a less than festive holiday on Wisteria Lane. Amidst each housewife's own drama, the culmination of desire and distress was depicted in the love triangle between Bree, Orson and Karl. After getting Orson to agree to a divorce, Bree was finally free to make it official with Karl. While Bree promised to keep the news of the divorce quiet until after the holiday's, Karl had other plans. 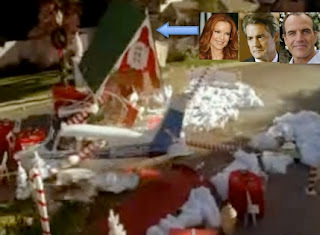 Karl decided to propose to Bree by hiring a plane to fly overtop of the Christmas party with a banner asking Bree to marry him. Bree is furious when she discovers Orson's plan, but it's too late to cancel the flight - the pilot is in the air and he's had a heart attack. The plane is headed right for Wisteria Lane! It just so happens that the three crossed lovers end up in a fight inside Santa's workshop just as the plane's wing slices through the structure. The final scene shows a bloody, dainty hand in the wreckage of the workshop. So, who do YOU think are among the deceased? Fingers are obviously being pointed at Bree, Orson and Karl, but would Cherry really kill off another housewife so soon after the loss of Edie? That's the point of these cliffhangers - they make you think and leave you hanging.